It was in sombre and pensive mood that the members of and visitors to the installation meeting of Great Marton Lodge No 3985 assembled at the Masonic Hall in Blackpool. Whilst installations are generally celebratory occasions, the jollity normally associated with a new master being installed into the chair of King Solomon was, on this occasion, rather muted. Pictured from left to right, are: Paul Hunter, Tony Bent, William Barrow and Rodney Barnes. Events of only a couple of weeks before the due date markedly subdued the pleasures of attending a well-produced and performed ceremony. The lodge had received the shocking news that its master, one of the most revered, admired and respected Freemasons in the Province, Marcus Hill MBE, had suddenly and unexpectedly passed to the Grand Lodge above. Marcus, who had celebrated his 50 years in Freemasonry during his year in office, had been eagerly preparing to install his successor into the chair. The brethren were stunned by the revelation of his passing. 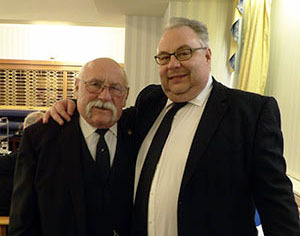 In an emotional and reverently orchestrated ceremony, Marcus’ good friend William Barrow was installed into the chair of the lodge in a dignified and sensitive manner. The lodge officers achieved a remarkably poignant and thoughtful balance between grief and celebration. Whilst savouring the delights of William’s installation, they never veered from the veneration and admiration they felt for Marcus. The whole ceremony was a reflection of the great esteem in which they held him. It was a fitting tribute to his memory and a commendation to the lodge’s sensitivity. The selection of principal guest to preside over the event could not have been more suitably planned. 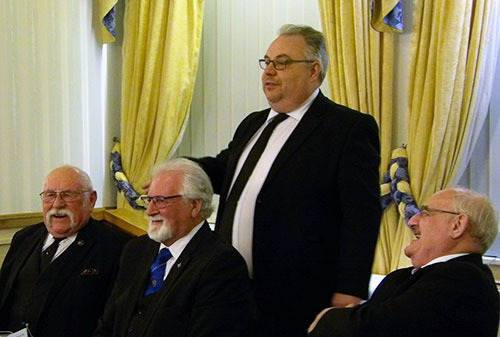 Effervescent yet wholly empathetic, Assistant Provincial Grand Master Tony Bent struck the perfect chord with the members and visitors, preserving that balance that the members had aimed to achieve. Accompanying Tony were many of Marcus’ great friends, including grand officers Geoffrey Pritchard and Blackpool Group Chairman John Turpin, further supported by acting Provincial grand officers Jim Finnegan, Fred Dickinson, Philip Houldsworth, Garry Byron and David Kenworthy, along with numerous Provincial grand officers that included group vice chairman David Cook and group secretary Steve Jelly. ‘The trio of light blues who performed the working tools’. Pictured from left to right, are: Christopher Pye, Paul Bennett and Neil Houldsworth. Opening the lodge with fitting reverence, immediate past master Rodney Barnes dispatched the general business and following the entrance, seating and customary salutations to the dignitaries, invited director of ceremonies Paul Hunter to occupy the master’s chair. Paul, in turn, invited Robert Taylor to occupy the office of installing senior warden, Tom Goodier to act as installing junior warden and Martyn Jones to undertake the role of installing inner guard. It was time to install William Barrow into the chair of King Solomon and what could be more fitting than to have his son Matthew present his father to the installing master? Simply answered – have his son actually install him! And that is exactly what transpired. Following William’s recital of his obligation as master elect, Paul invited Matthew Barrow to occupy the master’s chair and conduct the inner workings element of the ceremony, a plan that had been kept entirely from William. It was magnificent and emotive. It was as clear as crystal that William was moved and delighted. It was equally clear that it was an extremely proud and touching moment for Matthew too. It was the third occasion that William Barrow had been installed in the chair of a lodge. His first mastership was with Melita Lodge No 6783 in 1995 and then in Great Marton Lodge in 1999. He is a past pupil of Blackpool Grammar School and has the distinction of having been in the same class as Past Assistant Provincial Grand Master Terry Hudson. He had been a long-time friend of Marcus Hill, having first met him at the Holy Trinity youth club and so, understandably, the day was one of mixed emotions for William. Father and son: William and Matthew Barrow. 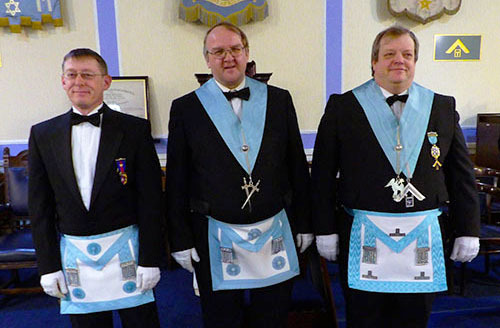 The members of Great Marton Lodge had become accustomed to excellence in their rituals and they were set on preserving that reputation at the installation. Each participant excelled themselves and produced a ceremony second to none. Following the delightful manner in which Matthew had installed his father during the inner workings, Rodney Barnes resumed his position as installing master and in masterly fashion, continued the ceremony. Inspired performances followed. First to grab the attention of the gathered throng were superb presentations of the working tools of each degree by Christopher Pye, Paul Bennett and Neil Houldsworth, all of whom are ‘light blue’ Masons. Each had the determination and will to produce excellence. They left no stone unturned and no avenues unexplored and emerged from their ordeals triumphant. The effect on the crowd was enchanting. These three performances set the scene for all to follow and follow they did. Investiture of lodge officers saw a flurry of magnificent presentations. Tom Houldsworth and Paul Hunter demonstrated that experience produces brilliance in their addresses to the senior and junior wardens respectively. Alan Jeffrey gave a sincere performance in his address to the deacons and John Turpin, recruited for the special address to the charity steward, displayed his qualities of leadership. 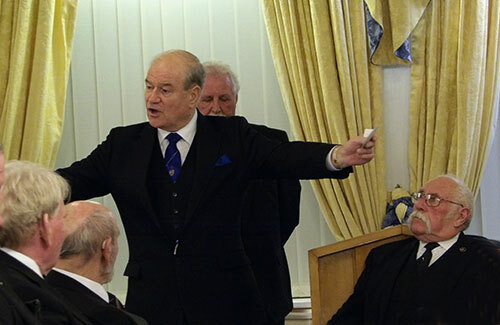 Matthew Barrow, challenged by the emotional address to the newly-installed master, demonstrated why he had been appointed as the lodge’s director of ceremonies for many years. The expressive nature of his delivery left a lasting memory in those present. Tony bent in full swing during his response to the third toast. Blackpool Group Vice Chairman David Cook, a man who takes everything in his stride and always performs with distinction, reinforced his reputation with a dazzling address to the wardens. 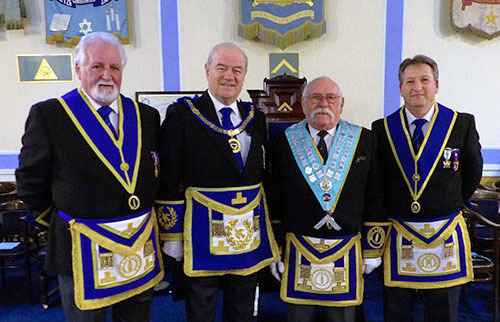 As a conclusion to the ceremony, Tony Bent was escorted to the south-east corner of the lodge room to address the brethren of Great Marton Lodge. In a powerful and animated performance, he captured the essence of the piece, yet maintained an apparent spontaneity. Conveying the greetings of the Provincial Grand Master at the denouement of the ceremony, Tony was full of praise for all who had participated in what he described as ‘a marvellous ceremony’. He was particularly lavish in his commendation of the three installing masters and the three ‘light blue’ Masons who had performed the working tools. His joy was even greater when presented with charitable disbursements totalling £2,000 in which £1,147.20 was donated to the West Lancashire Freemasons’ Charity, £552.80 went to the Masonic Charitable Foundation 2021 Festival and £300 to N Vision North West. “This is wonderful”, was his response to receiving the cheques and assured his audience that every penny would be faithfully applied. The success of the ceremony had, to a degree, eased the poignancy of the day and it was in a more elevated and comforted mood that the throng retired to the dining suite. There, recognition of the sensitive manner in which the proceedings had been conducted, occasioned a more celebratory atmosphere to prevail as attention was directed towards the newly-installed master. Matthew Barrow (standing) entertaining his father William, Paul Hunter and Alan Jeffrey. William Barrow claims a deal of fame as a gifted musician, having joined a jazz band in the 1960’s, and he continues to play regularly with a band to this day. Testimony to him as a highly accomplished musician is evinced by his record of having played on such shows as ‘Opportunity Knocks’, ‘It’s a Knockout’ and ‘Talk of the Town’. Bringing his own bit of razzamatazz to the lodge, William looks forward to a fruitful and enjoyable tenure. In his response to the third toast, Tony Bent talked of the excellence of the ceremony and the contribution that each member had made to the proceedings. He had been made extremely welcome and thanked the lodge for the warmth extended to him. Apprising the brethren of issues that the Provincial Grand Master deems of importance, Tony emphasised the need to make the Masonic Charitable Foundation 2021 Festival a resounding success. “Grand Lodge recognises the tremendous contribution that the Province of West Lancashire makes to Freemasonry in general and it is for this reason that it honoured the Province with the first festival of the newly formed Masonic Charitable Foundation.” He went on to congratulate the brethren present on the honours and promotions with which they had been conferred by the Province, naming Jim Finnegan, Matthew Barrow and Martyn Jones. He expressed great thanks to the acting Provincial grand officers who had supported him on the day and drew particular attention to the secretary of the lodge Rod Holt for all his efforts in making the necessary arrangements. At the toast to the new master, Matthew gave an emotional and heartfelt tribute to his father and in recognition of William’s eccentricities, presented him with a pair of socks. That is a story in itself! Rounding off the toast, Kit Keefe provided a glorious rendition of the master’s song, ably and enthusiastically accompanied on the organ by John Wall. That the day had been a success cannot be contested. That the lodge had pitched the celebrations at just the right level cannot be disputed. That the occasion was a fitting tribute – most definitely! Pictured from left to right, are: Jim Finnegan, David Cook, David Kenworthy, Garry Byrom, Tony Bent, William Barrow, Rodney Barnes, John Turpin, Philip Houldsworth, Fred Dickinson and Steve Jelly.